How Amazon’s Nashville pick ended a lot of anticipation in Tennessee. Good things come to those who wait. In Tennessee, a decade of preparation came to an end on Nov. 13 when Amazon announced it had selected Nashville for a $230-million, 5,000-job Operations Center of Excellence. The much-ballyhooed site selection process itself took 14 months, but Tennessee sealed the deal when it offered Seattle-based Amazon up to $102 million in performance-based incentives. The package is conditional upon Amazon creating 5,000 jobs with an average annual wage of over $150,000. This includes a cash grant from the state of $65 million based on the company creating those 5,000 jobs over the next seven years — or $13,000 per job. It also includes a cash grant from the city of Nashville of up to $15 million based on $500 for each job created over the next seven years; and a job tax credit to offset franchise and excise taxes from the state of $21.7 million, based on $4,500 per new job over the next seven years. Amazon plans to build its operations center in Nashville Yards, a 15-acre (6-hectare) mixed-use development in downtown Nashville. The 1-million-sq.-ft. (92,900-q.-m.) office complex will house the tech and management functions of Amazon’s Retail Operations division, including customer fulfillment, customer service, transportation and supply chain. In an exclusive interview with Site Selection, Commissioner Rolfe said Tennessee thought it was competing for Amazon’s HQ2 project when the company informed the state in September that it had changed strategy and was considering Nashville for a new logistics center of excellence. Amazon also had a history of investing heavily in Tennessee. From 2011 to 2017, Amazon invested more than $5 billion in the state, including customer fulfillment infrastructure and compensation to its 6,500 employees in Tennessee. Rolfe credits the city of Nashville, Davidson County, the Tennessee Valley Authority, the Nashville Area Chamber of Commerce, the Governor’s Office, and other state and local entities with working around the clock to close the mammoth deal. Was it the fiscal fitness of Tennessee and its capital that landed Amazon’s Project Gardendale — the code name for its 5,000-job Operations Center of Excellence and Eastern U.S. hub for Amazon’s Retail Operations division — in Nashville? Positive expansions and relocations to Nashville on the part of several major corporations (Lyft, UBS, Bridgestone and Philips Healthcare among others)? The region’s entrepreneurial and optimistic culture? State incentives worth about $102 million? Whatever the combination of state and local factors, Nashville got the nod. Along with the City of Nashville, the State of Tennessee also worked with key partners, including the Tennessee Valley Authority and Nashville Area Chamber of Commerce, to recruit the project to the state. Among the final exchanges between the Tennessee team and Amazon’s was a November 2 letter from Nashville Mayor David Briley to Amazon’s Holly Sullivan, a key player in the site selection process. Among other points, it summarizes the metro’s incentive proposal and outlines how the Job Grant component would work if agreed to by the Metropolitan Council and the Industrial Development Board. The letter also reminds Sullivan’s team of some key area attributes meant to boost confidence in siting the Operations Center in Music City U.S.A.; hot chicken, a Nashville staple, was not among them. That’s not a small point. Site Selection regularly emphasizes the importance of fiscal soundness and predictability to capital investors. Not all areas can compete effectively in that arena. Considering a Tennessee location? Wondering if the labor and skills supplies in the Volunteer State have the capacity to deliver now and in the future? Answers to those and other questions are supplied here by Jennifer Hagan-Dier, director of the Tennessee Manufacturing Extension Partnership Program, a key resource for current and future capital investors. 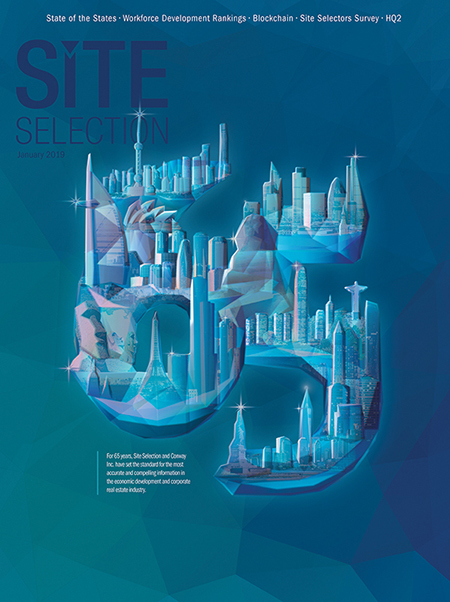 Following are excerpts of a late 2018 exchange with Site Selection Editor Mark Arend. Site Selection: What is the overall mood in the manufacturing community in Tennessee? Jennifer Hagan-Dier: Optimistic, vibrant and excited about growth opportunities tempered by uncertainty around global economic partnerships, trade policies and workforce shortages. Specifically, manufacturers are expressing uncertainty around the application and impacts of tariffs for raw materials coming in and finished products going out. Manufacturers in industries such as automotive, electrical appliances and food production are starting to see impacts of tariffs in their businesses and are examining supply chains and workforce needs more critically. The overall feeling across the state is one of optimism, but cost challenges around raw material imports, supply chain pressures, low unemployment and the potential negative impact on their business from tariffs are a concern for all Tennessee manufacturers regardless of industry sector. SS: “Finding skilled workers” is frequently cited as a primary challenge of manufacturers throughout the U.S. Is that the case in Tennessee, or should that phrase be adjusted to better reflect reality on the ground? JHD: It seems that almost every conversation we have with our manufacturing clients eventually leads to a conversation about workforce and workforce challenges. Tennessee manufacturers cite “finding skilled workers” as a primary challenge, but the reality is that it is not as simple as just “finding skilled workers.” With historically low unemployment rates and a competitive and business friendly environment, many Tennessee manufacturers point to challenges in finding, recruiting and retaining workers — qualified or not. The reality in Tennessee is that small and medium-sized manufacturers recognize they have challenges in terms of recruitment and retention of a skilled workforce, but they rarely have a handle on the improvements they can make in their facility and business to attract and keep talent. Culture matters. The work environment matters. Employee engagement and support matters. Process optimization and new technologies also matter. This is where the University of Tennessee Center for Industrial Services (UT CIS) and the Tennessee Manufacturing Extension Partnership (TMEP) program housed within UT CIS can help. TMEP works with small and medium sized manufacturers every day and has found that these manufacturers are often so focused on the “workforce challenge” that they fail to recognize opportunities to improve operations and adopt new technologies that can boost productivity and help manufacturers grow their business with the workforce they have. In addition, TMEP helps small and medium sized manufacturers identify the root cause of challenges including workforce challenges and works with them to develop a plan to prioritize and address the challenges. UT CIS has a statewide outreach network including a skilled and professional staff who live and work in each of the nine economic development regions and access to partners and resources with unrivaled business and technical expertise in manufacturing and economic development. SS: Not counting your MEP Center and UT CIS, what are the most beneficial agencies or resources available to manufacturers for assistance in overcoming these challenges? TN ECD is the lead for all economic development activities for the State of Tennessee. TN ECD works with manufacturers through the “FastTrack” program, which includes grants for infrastructure development, job training and a discretionary fund for a variety of other expenses. The TBR’s Office of Economic and Community Development mission is to develop and maintain a statewide approach for workforce development that directly impacts the state and its communities. The TNTrained program is a new initiative of Tennessee’s community and technical college system, in partnership with several state agencies, to access the education and training resources of all 40 of the College System’s campuses and meet the needs of business and industries. The TNTrained program designed a four-step process to ensure our workforce professionals are ready to assist and work together with meeting the client’s needs.